The strategy hierarchy is often taught in business and marketing schools today, stating that a strategy can be formulated at three different levels: corporate level, strategic business unit level (SBU), and functional (or departmental) level. It is important concept to understand because at these different levels, different strategic issues are addressed. Therefore, it will give you some guidance about what sort of strategy decisions are made at different levels. Because it is framed as a “hierarchy”, this implies that the decisions of strategy and are made at the top (corporate) level and then binding on the lower levels. In many ways, the strategic business unit will be responsible for implementing key aspects of the corporate strategy, likewise functional areas will be charged with the responsibility of executing key components of the strategic business unit level strategy. Please note that the three level strategy hierarchy model that is only relevant for large corporations that have multiple business units. For non-conglomerate organizations, they will only have two levels in strategy hierarchy – with the corporate level in the strategic business unit level being aggregated together. For small businesses, they will only have one level of strategy making, with all three levels of the strategy hierarchy being lumped together. 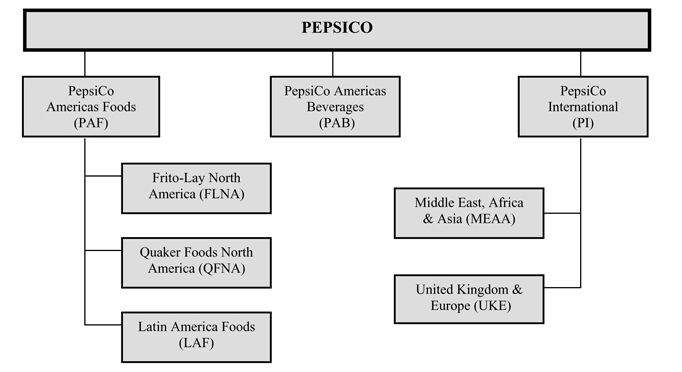 In this case, PepsiCo structure their business around collections of products (food and beverages) and across markets (domestic and international). 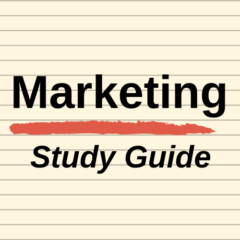 Essentially, each of these divisions (referred to as a strategic business unit in a marketing textbook), will have its own management team, its own goals, and its own strategy and resourcing. 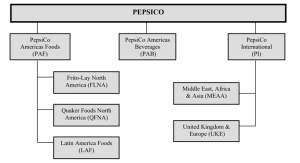 For more information on the PepsiCo structure and rationale, please refer to the source document for the above diagram. Corporate level strategy consists in selecting the types of businesses where the company will operate and compete. In the case of PepsiCo, they have decided to compete in the areas of drinks and snack foods across a global marketplace. Contrast that to Coca-Cola to have primarily remained a beverage focused company. In the past, PepsiCo also entered into the fast food sector, with well-known brands such as KFC, Pizza Hut and Taco Bell. These brands and since been structure off into their own operation – a decision that within have been made at the corporate strategy level. Identifying and developing the overall goals of the organization is the main responsibility of the corporate office. At this level of management also takes place the selection of the types of businesses the company will develop and the management and the integration of different business units. This section of the corporate strategy is focused on identifying and defining the company’s competition. The corporate strategy is focused on creating synergies between different business units. Therefore, it concerns the coordination of employees and resources and interdepartmental sharing and collaboration. The corporate strategy decides the level of centralization or decentralization as far as business units are concerned. A strategic business unit (SBU) is defined as “a unit of the company that has a separate mission and objectives and that can be planned independently from other company businesses”. At this particular business level, the strategy is focused on creating and sustaining a competitive advantage for the products or services that are being produced. At the business unit level, strategies mainly concern the company’s positioning against its competitors and adjusting the strategy according to different changes in the technological or social environment. At this level of an organization, we find the departments and operating divisions. Therefore, the strategy is focused on the value chain and business processes. Functional level strategies involve a certain department’s strategy and the coordination of resources at the business unit level. The functional level strategies translate the higher level strategies into concrete plans and actions.